Diesel fuel users in very cold weather climates need extra protection to keep ultra-low sulfur diesel fuels from gelling in the extreme winter temperatures. Cold weather fuel users know that as little as 7 degree shifts in temperature can start the gelling process in diesel fuel, even while sitting in an on-board fuel tank. The cold flow treatment game has changed in the recent past, for several key reasons. Today’s highly processed ULSD fuels gel easier and are less responsive to cold weather treatments than the fuels of the past. The refinery processing to remove the sulfur changed both the aromatic content of the fuel and also has changed the nature of the paraffin wax content that’s most directly responsible for diesel fuel gelling in the first place. The incorporation of low levels of biodiesel into conventional diesel fuel has also changed how the diesel fuel you use gels in the cold. Lastly, today’s common rail diesel engines have changed how diesel fuel gels in practice. Their newer, stricter fuel filters become filled with gelled diesel fuel wax at temperatures a lot closer to the fuel’s cloud point than its plug point. Which means winter diesel fuel users have to treat fuel for cold flow a lot earlier than they used to have to. 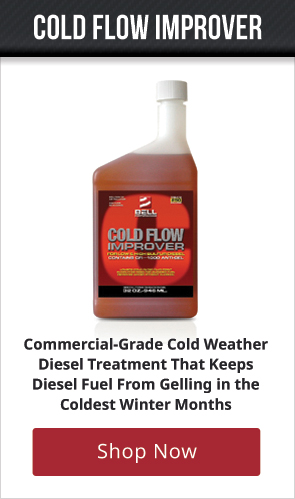 COLD FLOW IMPROVER is the commercial-grade cold weather diesel treatment that keeps diesel fuel from gelling in the coldest winter months. COLD FLOW IMPROVER's advanced polymers keep the paraffin crystals in diesel fuels from sticking together, lowering the pur point and cold filter plug points of the diesel fuel. Which means cold weather diesel users worry less about fuel shutdowns in the winter. 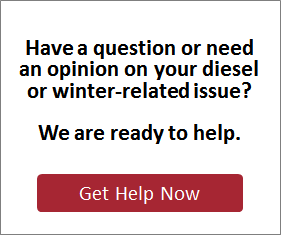 If you have any diesel or winter related fuel questions, please contact us for a consultation.